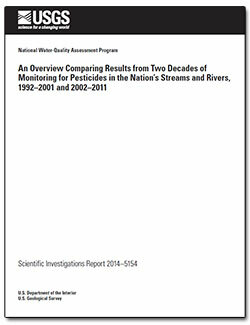 This report provides an overview of the U.S. Geological Survey National Water-Quality Assessment program and National Stream Quality Accounting Network findings for pesticide occurrence in U.S. streams and rivers during 2002–11 and compares them to findings for the previous decade (1992–2001). In addition, pesticide stream concentrations were compared to Human Health Benchmarks (HHBs) and chronic Aquatic Life Benchmarks (ALBs). The comparisons between the decades were intended to be simple and descriptive. Trends over time are being evaluated separately in a series of studies involving rigorous trend analysis. During both decades, one or more pesticides or pesticide degradates were detected more than 90 percent of the time in streams across all types of land uses. For individual pesticides during 2002–11, atrazine (and degradate, deethylatrazine), carbaryl, fipronil (and degradates), metolachlor, prometon, and simazine were detected in streams more than 50 percent of the time. In contrast, alachlor, chlorpyrifos, cyanazine, diazinon, EPTC, Dacthal, and tebuthiuron were detected less frequently in streams during the second decade than during the first decade. During 2002–11, only one stream had an annual mean pesticide concentration that exceeded an HHB. In contrast, 17 percent of agriculture land-use streams and one mixed land-use stream had annual mean pesticide concentrations that exceeded HHBs during 1992–2001. The difference between the first and second decades in terms of percent of streams exceeding HHBs was attributed to regulatory changes. During 2002–11, nearly two-thirds of agriculture land-use streams and nearly one-half of mixed land-use streams exceeded chronic ALBs. For urban land use, 90 percent of the streams exceeded a chronic ALB. Fipronil, metolachlor, malathion, cis-permethrin, and dichlorvos exceeded chronic ALBs for more than 10 percent of the streams. For agriculture and mixed land-use streams, the overall percent of streams that exceeded a chronic ALB was very similar between the decades. For urban land-use streams, the percent of streams exceeding a chronic ALB during 2002–11 nearly doubled that seen during 1992–2001. The reason for this difference was the inclusion of fipronil monitoring during the second decade. Across all land-use streams, the percent of streams exceeding a chronic ALB for fipronil during 2002–11 was greater than all other insecticides during both decades. The percent of streams exceeding a chronic ALB for metolachlor, chlorpyrifos, diazinon, malathion, and carbaryl decreased from the first decade to the second decade. The results of the 2002–11 summary and comparison to 1992–2001 are consistent with the results from more rigorous trend analysis of pesticide stream concentrations for individual streams in various regions of the U.S.
Stone, W.W., Gilliom, R.J., and Martin, J.D., 2014, An overview comparing results from two decades of monitoring for pesticides in the Nation’s streams and rivers, 1992–2001 and 2002–2011: U.S. Geological Survey Scientific Investigations Report 2014–5154, 23 p., http://dx.doi.org/10.3133/sir20145154.